Literacy lessons sent from the Outback by the Overland Australia team of Expedition 360 for use by classrooms worldwide free of charge. 2001 September 4, Tuesday. Alice Springs. the shape of the land came to be the way they are today. them of the dangers of going too close to it. which the tribe calls a kupi-kupi, and warns of the danger of snakes. were so sorrowful that they moved far away to other lands. taken her, and sent a man out to search for her by the waterhole. pulled her back. She disappeared into the water. while the wanampi slept. He began to carry her back to her parents. her it returned to the waterhole. her, but the girl was very sick and sweating. favourite space? What dangers are found near where you live? This is exactly what Pastor Carl Strehlow faced when he arrived at the Hermannsburg Mission in 1894. Not only did missionaries work tirelessly to create and upkeep a mission, their main concern revolved around spreading Christianity. Using the bible as a teaching tool, people could also be taught to read and write from its pages. Strehlow began the arduous task of learning the Arrernte Aboriginal language. He then translated the New Testament into Arrernte and also wrote several important works of the Arrernte people. Now they were able to comprehend the foreign words and symbols. Imagine being given the task of teaching the ideas of Christianity to Aborigines with different spiritual beliefs. Carl Strehlow researched and studied the Arrernte culture. He familiarised himself with their stories. The Christian scripture was then altered as he taught it to the Arrernte. Strehlow rewrote biblical passages recreating parables from the New Testament. The parables were written incorporating Aboriginal customs with main characters from the New Testament. Also, instead of translating the text word for word, he adapted some of the stories to be more palatable to the Arrernte. For example, instead of having Jesus lead the 12 desciples from the front, as is stated in the New Testament, the Arrernte bible has him leading from the back. This is because a person must have absolute trust in someone walking behind them, especially if they are weilding a spear. Suggested activities: Retell a story using symbols or sign language. Create your own language symbols with a partner. Write a story to share with a group ‘speaking’ or ‘writing’ in another language. In the Dreamtime, the Milky Way was made of a group of Star-Women who danced across the sky. One of the women grew tired of carrying her baby as she danced, and placed him in his wooden baby-carrier, called a turna (pronounced toor-na). She rejoined the other women, and as they danced, the turna rolled over the edge of the dancing area and plummeted toward the earth. The baby crashed to the ground, his turna falling on top of him. The impact of the turna caused surrounding rocks to be thrust upward, forming the circular walls of Tnorala (the Aboriginal name for Gosse’s Bluff). The baby from the Milky Way was hidden from view by the settling clouds of red sand. His mother, the evening star, and his father, the morning star, still search for their missing child every day and every night. Suggested activity: Read up on the history of a natural landmark that interests you. Write your own myth about the origins of this place. Wendy Baarda of Yuendumu, Northern Territory, loves her work. For the past twenty seven years she has been teaching. Her school is unique in that it has been a bilingual school since 1974. It is one of approximately twenty in the Northern Territory. The second language that is spoken? English! The town of Yuendumu is home to the Warlpiri Aboriginals and the children are taught until grade three in their native language. A push by the educational system to drop the bilingual programs two years ago was met with strong resistance by educators and the families served by the program. The thought behind this was that it is more effective to have children from non-English speaking backgrounds beginning to speak English at an early age. And, does speaking in the Warlpiri language help to preserve the culture? Wendy believes it does. As children grow in the knowledge of their ancestors, they develop a pride in their heritage. They seem much more comfortable in their early school years, being taught by both Aboriginal and non-Aboriginal teachers in a team teaching situation. “Children will have a better chance to preserve their native language in a bilingual school. Unfortunately, to date, many native languages have been lost.” And, as Aboriginals and non-Aboriginals share in the education process, perhaps a deeper understanding and appreciation of cultures can be found. Suggested activities: Research the country of your ancestors or a country you find interesting. What are examples of that culture, its art, music, places of interest, people from the country who ‘made a difference.’ Interview a relative about life in that country. Learn a simple phrase from the language and teach it to your classmates. The sun had just cleared the horizon as Butch jostled with his station sheepdog friends Ginger, Spike, Sandy and Ringer for the best position in the back of 4WD to catch the cool morning air which lulled his tongue sloppily along. A few minutes later Rex pulled into his next-door neighbour’s station to be met with the familiar “G’day Rex - the Billy’s on. Better have a cup of tea”. Butch and his friends bounded from the Toyota and playfully growled and gambolled with Ray’s station dogs while Rex and Ray discussed the stray sheep to be picked up. “Fine looking pup you’ve got there Rex”, said Ray. “Yeah Ray, Butcher by name and butcher by trade”, obviously referring to Butch’s enthusiastic herding of the sheep when sometimes he might have a little taste-test. Jumping from the Toyota once again as they arrived back at Grassmere Station, Butch ran to the rainwater tank and lapped thirstily from the drip-tray, pleased with his little outing for the morning. Later that day, Rex was surprised to see Ray coming through the bushes in his 4WD as all the dogs rushed out to bark at the approaching vehicle. Then – disaster! While lunging for the best position to playfully bite the tyres Butch found himself pushed off-balance by Spike and thrown under the wheels of the fast moving vehicle, breaking his hind leg. Rex was horrified to see Butch disappearing into the bushes, obviously badly injured by the extent of the poor animal’s terrified howls. “Jeez. Sorry Rex - I didn’t see him”, said Ray. “Not your fault Ray, I think Butch will think twice about doing that again. Hell, I hope he comes back though”, said Rex - almost as an afterthought. The hot afternoon wore on and there was still no sign of Butch despite much searching and calling. Rex became more and more despondent when Butch still hadn’t returned the next morning before he had to leave to collect stores from the country town of Broken Hill, 100 miles away. As Rex drove home in the evening to find Butch had still not returned to his chain and water dish, he was almost in tears. The next morning, while descending into the creek bed with the rest of the dogs in back of the Toyota, Rex suddenly hit the brakes simultaneously yelling to the dogs to “stay”. For once the dogs where obedient! Rex jumped out and ran forward on the road to study fresh dog tracks. Sure enough, there were 3 x clear paw prints and a drag mark – “Mmmh. This looks to me like tracks of a dog about Butch’s size”, thought Rex to himself. Carefully following the tracks through the bushes under the gum trees Rex followed the tracks in the sand for about 200 metres before they disappeared into a fox’s den hidden in a thick bush. Crouching down, Rex peered in and sure enough there lay a sick and sorry Butch. At the same time as kicking the bush aside, Rex removed his shirt to carefully wrap around Butch’s head so he wouldn’t get bitten when lifting him into the truck (and thereby unintentionally causing him considerable pain). After laying Butch on the front seat (which is a huge privilege in station dog life! ), Rex turned the vehicle around and headed back home. “Yeah Bob, his leg’s broken in three places I reckon”, Butch heard Rex say from his comfortable position on the lounge room couch. “So, if you are flying out to Texas Downs Station this afternoon, maybe you could call in here about 4 p.m. to take a look at Butch’s leg”, Rex said to the flying vet. Butch contentedly finished off his once in a lifetime ice-cream bowl and thankfully lay back against the couch, knowing that he would soon be made well again by the dog-doctor. With this reassuring thought he slowly drifted back to sleep. Suggested Learning activities: Creative Writing. Write a creative story of around 300-400 words about tracking an animal in the wild. 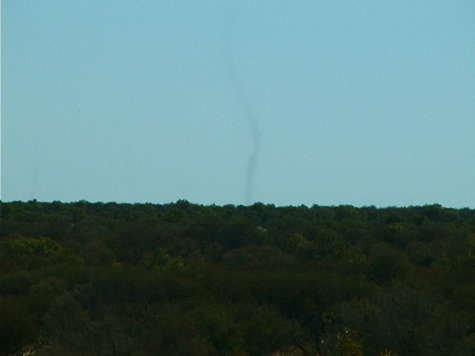 State what animal it is and why you are tracking it. In the Dreamtime all earth lay sleeping. Nothing moved. Nothing grew. One day the Rainbow Serpent awoke from her slumber and came out from under the ground. The frogs came out slow because their bellies were heavy with water, which they had stored in their sleep. The Rainbow serpent tickled their stomachs and when the frogs laughed, water ran all over the earth to fill the tracks of the Rainbow serpents’ wanderings. This is how lakes and rivers were formed. With water, grass and trees sprang up. Also all animals awoke and followed the rainbow serpent across the land. They were happy on earth and each lived and gathered food with his own tribe. Some animals live in rocks, others on the plains and others in trees and in the air. The Rainbow Serpent made laws that they all were to obey, but some became quarrelsome and made trouble. The Rainbow Serpent said,” Those who keep my laws will be rewarded; I shall give them human form. Those who break my laws will be punished and turned to stone, never to walk the earth again. The lawbreakers became stone and turned to mountains and hills, but those who kept the laws were turned into human form. The Rainbow Serpent gave each of them their own totem of the animal, bird or reptile from whence they came. The tribes knew themselves by their totems. Kangaroo, emu, carpet snake, and many, many more. So no one would starve, the Rainbow Serpent ruled that no man should eat of his totem, but only of other totems. This way there was food for everyone. The tribes lived together on the land given to them by the Rainbow Serpent or Mother of Life and knew the land would always be theirs, and no one should ever take it from them. 1.After studying different creation myths from all around the world, compare and contrast them to the story of the Rainbow Serpent. Example: In the beginning of the bible all was dark, just as in this story. Also, in the bible the snake is considered the devil, and is a villain. 2.Could you consider this myth truth? Or is it just a myth? Try to think of it from an Aboriginal standpoint. 2001 September 27, Thursday. 10 kilometres west of Lajamanu Community. Those who do speak ‘Australian’ are likely to confuse a foreigner with their strange collection of words, which differ greatly from those used in English-speaking countries north of the equator. Some commonly used words have been shortened almost beyond recognition. Others have been derived from Aboriginal languages, or from the slang used by early convict settlers. In the Northern Territory, English is a second language which is little used by many indigenous people. Around seven hundred dialects of two hundred and fifty native languages were spoken across the continent of Australia before settlement by white Europeans. While many of these have since petered out, or have been merged into the dominant languages of their area, others have grown, and about one hundred distinct language groups remain today. In the beginning, there was probably one language shared by all native people here. As the aborigines moved far apart to settle the whole country, different ways of speaking developed until their languages were so distinct that tribes could no longer understand each other. Today, there are still some words used by indigenous people all over the continent, such as jina, meaning ‘foot’, and mala, meaning ‘hand’. A bright yellow and black sign which we encountered on the road from Tanami Gold Mine to Lajamanu let us know we were on aboriginal owned land – see picture. We interpreted the sign to mean, in the western desert Anangu dialect of Yankunytjatjara: “Pukul ngalyayanama Ananguku ngurakutu.” and in the Pitjantjatjara dialect: “Pukulpa pitjama Ananguku ngurakutu.” – Both of which mean “Welcome To Our Aboriginal Land”. Many places throughout Australia have kept their aboriginal names. Others have had their traditional names reinstated. Uluru, long known Ayers Rock, is a well-known example of this. These traditional names derive from indigenous belief in the continuing existence of spirit beings: the ancestors of all living things, which lived on earth during the dreamtime, and are believed to have created all the features of the natural world. “They took different forms but behaved as people do, and as they travelled about they left signs to show where they passed. Despite being supernatural, the ancestors were subject to ageing and eventually they returned to the sleep from which they’d awoken at the dawn of time. 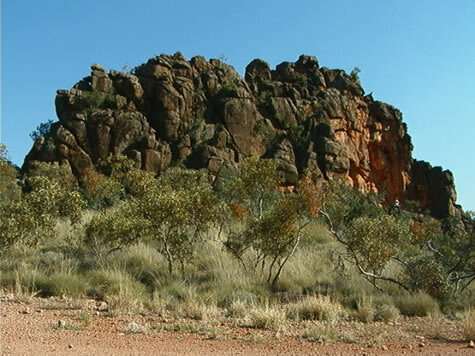 We saw a hill in Alice Springs, which is a sacred site to the Anangu people, and which is called ‘Atyarlkarle Tyaneme’. 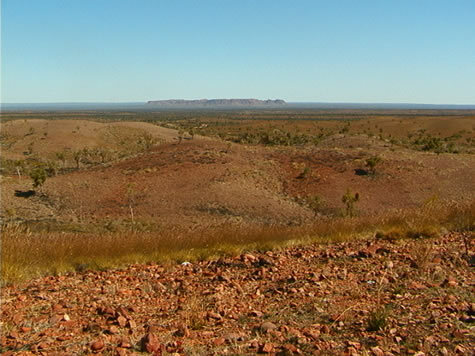 (That is, “the body of the Atyarkarle before it crosses over’) This small hill is the Atyakarle (Caterpillar) before it crosses the Todd River heading East toward Emily Gap in the MacDonnell Ranges. 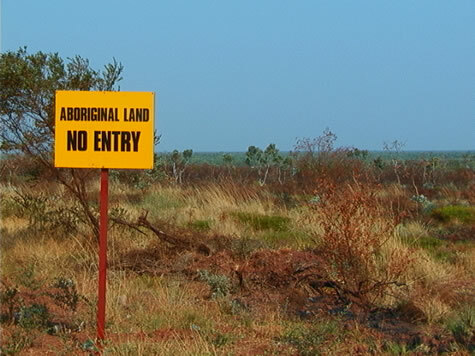 Compare the two examples of Western Desert Anangu dialect for the greeting “Welcome To Our Aboriginal Land”. Look at the differences between dialects and distinct languages. 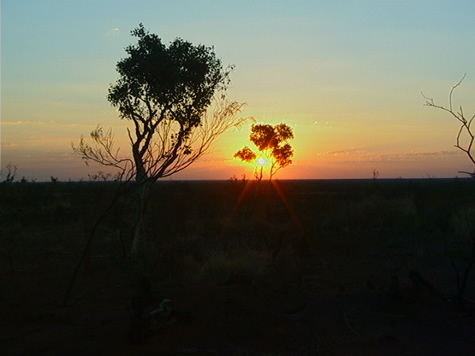 The Pitjantjatjara and Yankunytjatjara people are mostly able to understand each other. Learning a second language helps us to communicate with people all over the world. Ask your family and teachers what other languages they can speak beside English. Write down ways to say ‘hello’ in as many different languages as you are able – ask all of your teachers to add to your list. Starting today, we will have a few aboriginal place names at the end of each general update, and tell you the meaning of the words. A place name near my home, ‘Wangaratta’, means “The meeting of the waters (of two rivers) where the cormorant (a big water bird which is also called a shag) rests”. Try to find out how your home town, and some of the interesting places around where you live, came to be named what they are. This page contains all entries posted to Australia Lesson Activities - Literacy in September 2001. They are listed from oldest to newest.